Adderall is used to treat narcolepsy and attention deficit hyperactivity disorder (ADHD). Adderall may also be used for purposes not listed in this medication guide. Adderall is a combination of two stimulant drugs, amphetamine and dextroamphetamine. Adderall XR is an extended-release form of the drug. Doctors also prescribe Adderall (but not Adderall XR) to treat narcolepsy. Adderall may help people with ADHD control their activities and increase their attention spans. The drug may also prevent symptoms of narcolepsy, which include excessive sleepiness and sudden attacks of daytime sleepiness. The Food and Drug Administration (FDA) approved Adderall in 1960. The agency also has approved the combination of amphetamine and dextroamphetamine as a generic drug. DSM Pharmaceuticals makes the brand-name drug, and many drug companies make a generic version. Do not use this medicine if you have used a MAO inhibitorin the past 14 days, such as isocarboxazid, linezolid, methylene blue injection, phenelzine, rasagiline, selegiline, or tranylcypromine. Adderall may cause new or worsening psychosis (unusual thoughts or behavior), especially if you have a history of depression, mental illness, or bipolar disorder. Call your doctor right away if you have: signs of heart problems – chest pain, feeling light-headed or short of breath; signs of psychosis – paranoia, aggression, new behavior problems, seeing or hearing things that are not real; signs of circulation problems – unexplained wounds on your fingers or toes. Research shows that the number of ADHD medications prescribed to children increased 45 percent from 2002 to 2010. Of these drugs, Adderall was the second most-prescribed medication. This increased availability of Adderall has led to widespread abuse of the medication. Because Adderall increases dopamine levels, it can trigger a feeling of euphoria among people who don’t have a medical reason to take it. As a result, it has become a drug of choice among people trying to get “high,” who often crush and snort the pills or mix them water and inject them. This off-label use of Adderall is a growing trend, particularly among high school and college students who are trying to study for exams or boost their academic performance. 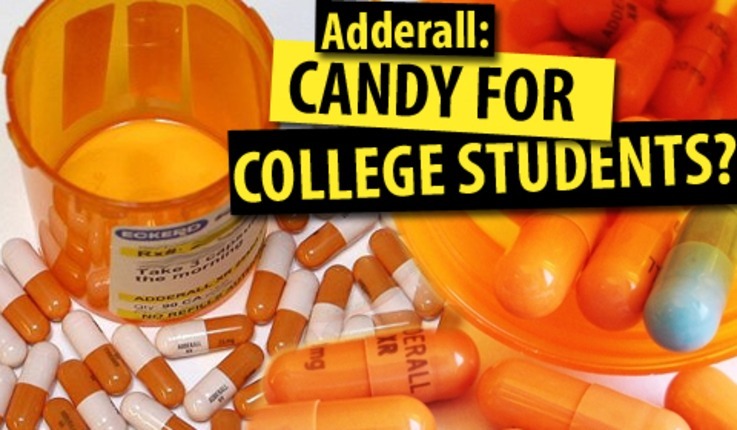 Stimulants like Adderall, sometimes called “smart pills,” are currently the second most common form of drug use on college campuses. Despite the widespread belief that Adderall can improve a person’s ability to learn, the drug does not enhance thinking ability in people who do not have ADHD. Young people who do not have ADHD but are taking Adderall to get better grades in school or gain an academic advantage are at risk for potentially deadly side effects. Read all patient information, medication guides, and instruction sheets provided to you. Ask your doctor or pharmacist if you have any questions. You may take Adderall with or without food, first thing in the morning. To make swallowing easier, you may open the capsule and sprinkle the medicine into a spoonful of applesauce. Swallow right away without chewing. Do not save the mixture for later use. While using this medicine, your doctor will need to check your progress at regular visits. Tell any doctor who treats you that you are using this medicine. Adderall can cause unusual results with certain medical tests. Tell any doctor who treats you that you are using this medicine. Store at room temperature away from moisture, heat, and light. Doses of Adderall are individualized, so your dose will depend on why you’re taking Adderall, and on your response to the drug. Doctors usually start with a low dose and increase the amount gradually. The best dose will be the lowest possible dose that works. A child older than 5 who is taking Adderall for ADHD would typically start with a dose of 5 milligrams (mg) and increase it gradually to 30 mg.
A typical dose for an adult with narcolepsy may start at 5 mg and increase to 60 mg. You can take Adderall and Adderall XR with or without food. People usually take Adderall tablets every four to six hours during the day. Guidelines call for swallowing capsules whole. Or, you can open the capsule and sprinkle the contents into a teaspoon of applesauce. It’s important to take any opened medicine right away. Take Adderall exactly as directed by the doctor. Do not stop taking Adderall suddenly. This can cause severe depression, extreme tiredness, and other Adderall withdrawal symptoms. If you miss a dose of Adderall, take the missed dose as soon as you remember. But, if it’s almost time for the next dose, skip the missed dose. Adderall can increase your risk for heart problems, high blood pressure, and stroke. If the person taking Adderall has a history of a heart defect or other heart problems, there is a risk for sudden death. Doctors need to check children for any heart problems before prescribing Adderall. Adderall may increase your risk for mental health problems, including depression, bipolar disorder, and unusual behaviors including aggressive or hostile behavior. Adderall may be habit-forming. This is more likely if you take Adderall in larger doses, more often, or for longer than recommended by your doctor. You may need to take increasingly greater doses to control symptoms, but taking larger doses increases your risk for heart and mental health problems. It’s also important confirm a diagnosis of ADHD before treating a child with Adderall. Sometimes, poor school performance or behavioral issues are symptoms of other problems that need treatment, such as trauma, dyslexia, or mental illness. Medical experts do not know whether Adderall is safe for elderly people. If you are older than 65, ask your doctor whether there are other drug options that might be safer for you. If you suddenly stop taking Adderall, you may have Adderall withdrawal symptoms, also known as an “Adderall crash.” Symptoms of Adderall withdrawal can include depression, insomnia or other sleep disorders, irritability, and extreme fatigue. You are at higher risk for Adderall addiction if you have abused drugs or alcohol in the past. Adderall might be unsafe to take during pregnancy. Because of this, talk with your doctor before starting Adderall if you are pregnant or may become pregnant, and call your doctor right away if you get pregnant while on Adderall.